This is the public profile of Alex King, Additional information and high-resolution images are available for accredited press members, to access additional information about Alex King please login as a press member. About Alex King : Alex King is a product designer and worked extensively in Hong Kong and Shanghai. He holds a Bachelor degree in Product Design and MBA in Hong Kong Polytechnic University. He is specializing in inclusive design, health care, elderly research and sustainable product development. He has received numerous design awards over the past 16 years in design industry. 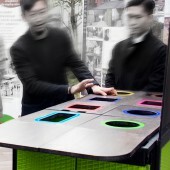 Recently, he swept the champion in Mobile Collection Points Design Competition organized by Environmental Protection Department, HKSAR, offering a flexible recycling solution for public and recyclers. He was an awarded designer in New Business Ideas Incubation Circle Convention, New World Development in 2017. In 2010, he designed a pair of ‘Broken Frame” to raise awareness on re-establishing human relationship not with the eyes, but with the mind. This makes him took a Silver Prize from OPUS JAPAN Optical Design Competition in Osaka. Alex promotes Inclusive Design since he joined multi-national corporations of telecommunication in 2003. He worked closely with Switel, Sanyo, Motorola and PCCW to develop simplified phone for older persons benefiting people for all. Alex has substantial experience in teaching. He teaches bachelor courses in PolyU and HKDI and committed to contributing and promoting creative industry. He had successfully developed foundation design courses and e-learning programmes for part-time learners in Open University of Hong Kong as he believed design innovation can change our world. He was nominated as subject officer on behalf of OUHK in Creative Industry Discipline of CreateHK. He is a full member of HKDA, CSD and IET and served as judger for footwear, sustainable tableware and international product design competitions since 2009. Recently, Alex is appointed as principal consultant in game sets design for people with dementia and flexible showcase for luxury jewelry with NGOs and listed company respectively. He established a new company “Form Follow Function” in 2018.
what is design? what is not? King, A.P. & Siu, K.W.M. (2017) “Redeveloping Game Set for Living Alone Elderly with Dementia Using Participatory Action Research Approach in Hong Kong.” Advances in Intelligent Systems and Computing, Springer, pp.129-138, ISBN: 978-3-319-60597-5. King, A.P. & Siu, K.W.M. (2017) "Universal Design Gameplay as a Rehabilitation Tool for Elderly Living Alone with Dementia: Participant Observation and Participatory Design Approach” In the 11th International Conference on Design Principles & Practices at Institute without Boundaries at George Brown College, Toronto, Canada. King, A.P. (2016) “Developing Cognitively Gameplay as a Rehabilitation Tool for Elderly Living with Dementia: Universal Design focus” In International Conference on Global Design Network, Hong Kong, 30 Nov 2016. Press Members: Request an exclusive interview with Alex King.